Austen's been loving Adler. Sometimes a little too much and a little too roughly but for the most part I know he likes having her around and she likes having him there too. When she's not within eyesight, he'll say to me "Where's Abbie?" And, today when I was reading him a book at naptime with a dog in it that looked almost like Adler, he mentioned that the dog was Adler or "Abbie" as he calls her. Then tonight at bedtime we were reading another book with a dog in it and I said, hey, look it's Adler. He must've noticed the dog didn't look anything like Adler and it didn't because he shook his head and said, "No, Abbie." We've also been teaching Austen to use Adler's commands lately. He's really good at being bossy and telling her to "get down!" which is supposed to really be sit but he likes to be extra forceful! We just taught him to tell Adler to give him her paw and he loves this trick. Of course he says "Ab Paw" but she gets the idea. Check out the video below of the two of them up to their new tricks. Chicago has been getting lots of snow (and lots of cold weather) over the past month or so which gave us many perfect opportunities to go sledding! Unfortunately, we didn't have a sled yet when the snow first began to fall at the end of 2008 and since we live in the city, there were fewer stores that sold sleds and therefore, no sleds when we finally went to go buy one. Well, during one of my treks to the burbs when I was doing Xmas shopping, I finally found a sled for Austen. 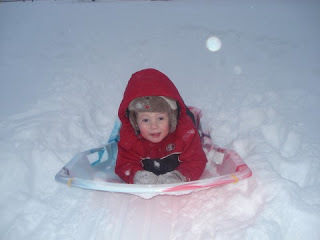 He got to try it out last weekend at a hill that Tom used to sled at when he was young. At first we thought Austen might be scared going down the hill by himself so Tom went with him. I then told Tom to let him go on his own. He loved it! I don't know what we were worried about since we heard him laughing the whole way down and he had the biggest smile ever on his face. We sent him down by himself sitting up, on his belly and then Tom and I took turns riding with him. I forgot how much fun sledding could be. The only thing that could have made it a more perfect day was to have Adler there frolicking in the snow with us. Here's a video of Austen heading down the hill on his belly and a video of him sledding on his own. The video is a little blurry since there's motion but you get the idea. No, that's not a typo. That's how my now officially 'two' year old sings happy birthday ending with him puffing out his cheeks and blowing out imaginary candles. - Austen made us sing happy birthday to him twice. After we sang to him the first time he put his hands together to sign to us that he wanted 'more.' Of course he said more too but signing more is part of what he does now too. Anyway, how could we resist especially since I accidentally only put one fire hydrant candle in his cupcake instead of two! So it worked out perfectly. When we were done singing the second time, Austen was satisfied, clapped his hands and blew out his final candle proclaiming him two years old. - Austen had a big helium filled fire truck balloon. The string somehow came off the balloon when Austen was playing with it and the balloon floated up to to our 12-foot ceilings. The guys at the party tried to help him retrieve it by taking turns holding Austen by the seat of his pants and lifting him up toward the ceiling, telling him to grab the balloon. Of course some of the guys weren't tall enough and Austen couldn't get a handle on the balloon but it made for some good entertainment. See picture below. - Who knew Austen would be so mesmerized by a pair of sunglasses. After unwrapping his new sunglasses he tried to put them on his face, upside down, right side up - it didn't matter. He wasn't letting anyone help him with them and he wasn't parting with them either. - Other highlights include Austen (with his cousin, Ryan) riding his new Plasma car. Anything that he can ride on, he loves and does not give up. Austen also had fun dragging unsuspecting adults to his room to play with him and his trains. They were all good sports though - after all, how can you resist when a two year old singles you out to be their playmate. Kind of makes you feel special. 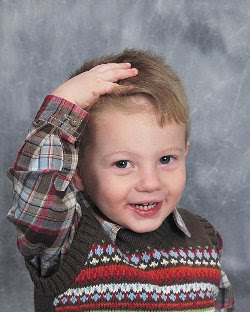 During break, I asked my mom to help me take Austen for his two-year-old pictures. The last two times Tom and I have taken him, he hasn't been all that great. Lots of crying and clinging and not wanting to get his picture taken. It's a wonder we got any good shots at all. I wasn't looking forward to this time either considering our past experiences. Turns out all my worries were for naught. My kid was a model! Okay, yes, I think he's cute and could be model potential but the way he responded to the photographer's directions were just amazing and like a little model would! He listened so well to her and did exactly what she said and even put up with an outfit change! She was impressed and so were Grandma and I! It must have been all the pictures I have been taking of him for the blog. He loves my camera and I don't really let him touch it so for Xmas I bought him his own. 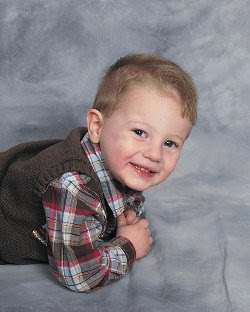 He loves to walk around and take pictures while saying "Cheese!" Of course Adler is one of his favorite subjects. Here's a few shots of our little guy - soon to be two! Actually, Austen has been pretty good (I'm crossing my fingers that this doesn't jinx me). Aside from not wanting to sit on Santa's lap and the typical two-year-old temper tantrums, I found that he understands so much of what we say that you can talk to him and head off potential melt downs. - Austen enjoyed unwrapping his presents. He often held on to a favorite gift until something better was unwrapped before he would give up his current favorite. His favorite gift this Xmas was probably his Thomas the Train motorized train set. I don't know if I'm happy I bought that thing. When it derails, it's hard for a two-year-old to get it back on course so there's a lot of whining. And, he doesn't like it when one train runs into the other. You can hear him saying "Oh no!" and start crying! Not a good play by yourself toy and unfortunately this is what he wants to play with a lot! - Austen has also become a little crazy about Elmo. We bought him a little stuffed one that he sleeps with and Grandma bought him Elmo live. We've found him hugging the big heavy Elmo live and also sticking his fingers in Elmo's mouth and then saying to Elmo "no bite!" I wonder where he hears that most often?! As for Adler, every day I give her a great big kiss and a few extra treats (don't tell Tom) and thank her for being an awesome dog. I mean what other dog wouldn't touch all of Austen's toys scattered all over the floor including matchbox cars, little balls and stuffed Elmos. I guess it's the dog that doesn't sniff out and eat the treats that Tom leaves in his coat on the chair everyday. Seriously, can I just say that I love my dog! But then again, most of you probably know that considering I started this blog about her. Well, there's a few more days left of vacation for a few more antics before I head back to work and Austen heads back to school. I'll keep you posted. Life will then go back to normal and my postings will be more regular too.